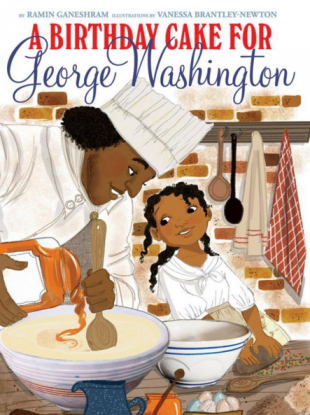 US PUBLISHER SCHOLASTIC is pulling a new picture book about George Washington and his slaves amid objections it sentimentalises a brutal part of American history. A Birthday Cake for George Washington has been strongly criticised for its upbeat images and story of Washington’s cook, the slave Hercules and his daughter, Delia. The book, which depicts Hercules and Delia preparing a cake for Washington, has received more than 100 one-star reviews on Amazon.com. While notes in A Birthday Cake for George Washington from author Ramon Ganeshram and illustrator Vanessa Brantley-Newton had pointed out the historical context of the 18th century story and that Hercules eventually escaped, some critics faulted Ganeshram and Brantley-Newton for leaving out those details from the main narrative. “Oh, how George Washington loves his cake!” reads the publisher’s description of the story. And, oh, how he depends on Hercules, his head chef, to make it for him. Hercules, a slave, takes great pride in baking the president’s cake. But this year there is one problem — they are out of sugar. In a Scholastic blog post from last week, Ganeshram wrote that the story was based on historical research and meant to honour the slaves’ skill and resourcefulness. “How could they smile? How could they be anything but unrelentingly miserable?” Ganeshram wrote. How could they be proud to bake a cake for George Washington? The answers to those questions are complex because human nature is complex. Bizarrely and yes, disturbingly, there were some enslaved people who had a better quality of life than others and ‘close’ relationships with those who enslaved them. But they were smart enough to use those ‘advantages’ to improve their lives. Sunday’s announcement comes amid an ongoing debate about the lack of diversity in publishing, although the collaborators on A Birthday Cake come from a variety of backgrounds. Ganeshram is an award-winning journalist and author born to a Trinidadian father and Iranian mother and has a long history of food writing. Her previous works include the novel “Stir It Up” and the nonfiction Future Chefs. Brantley-Newton, who has described herself as coming from a “blended background — African American, Asian, European, and Jewish,” has illustrated the children’s series Ruby and the Booker Boys among other books. The editor was Andrea Davis Pinkney, also an author who in 2013 won a Coretta Scott King prize for African-American children’s literature. The pulling of the Washington book also recalls a similar controversy from last year. A Fine Dessert, written by Emily Jenkins and illustrated by Sophie Blackall, was criticised for its cheerful depiction of a 19th century slave mother and daughter as they prepared a blackberry recipe. Jenkins apologised, saying that her book, which she “intended to be inclusive and truthful and hopeful, is racially insensitive.” The book remains in print. Email “This book about George Washington's happy looking slaves has been pulled from the shelves”. Feedback on “This book about George Washington's happy looking slaves has been pulled from the shelves”.